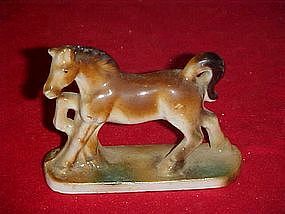 This old horse figurine is stamped Japan. It is made of porcelain and has a hollow bottom. Measures 2 3/4" tall and is about 3 1/2" long. Perfect condition.